NORFOLK, VA – The Atlantic States Marine Fisheries Commission (ASMFC) presented Paul J. Diodati, former director of the Massachusetts Div. of Marine Fisheries (MA DMF), the Captain David H. Hart Award – its most prestigious annual award – at the commission’s recent annual meeting here. At the same meeting, ASMFC member states thanked Douglas Grout of New Hampshire for his two-year term as chair and elected James J. Gilmore Jr. of New York to succeed him. For over four decades, Diodati has been a prominent figure in the marine fisheries management community throughout New England and along the Atlantic coast. While now retired, the impact of his accomplishments to Atlantic coast fisheries conservation and management will be felt for much longer. Diodati’s career in marine fisheries began at MA DMF in 1975 as a contracted sea sampler for northern shrimp. Over the years, he worked his way up through the ranks to division director, a position he served in for his final 15 years at DMF. In between, Diodati served as technical and policy advisor for striped bass and northern shrimp, sportfish program director, and co-creator and co-chair of the Massachusetts Marine Fisheries Institute. Understanding the need to address user conflicts before they begin, he was heavily involved in the development of the Massachusetts Ocean Management Plan and the Federal Ocean Management Plan. Diodati closed major data gaps by requiring comprehensive reporting from dealers in 2005 and all commercial harvesters in 2010. In 2009, he was instrumental in establishing the state’s saltwater fishing license. As Massachusetts’ administrative commissioner since 2000, Diodati chaired numerous management boards, overseeing the development and implementation of interstate management plans for species such as striped bass, shad, and river herring. From 2010–2013, he provided leadership to the commission, serving as vice-chair and chair and worked to raise the ASMFC profile both on Capitol Hill and within the administration – ensuring the 15 Atlantic states were well equipped to tackle both current and emerging issues. between the states and their federal partners. Diodati’s lifetime has been marked by a commitment to science and sound management and his efforts have been instrumental in improving fisheries programs both in Massachusetts and along the coast. But his legacy is more than scientific papers, surveys conducted, and recovered species. Diodati will be remembered for his extraordinary way with people. From recreational and commercial fishermen to his peers at the commission and New England Fishery Management Council, he was well known and trusted as a coalition builder and deal maker. Newly elected ASFMC chair Gilmore has served as director of the Div. of Marine Resources for the New York Dept. of Environmental Conservation for the past 10 years. As a respected marine scientist and fisheries manager with more than 40 years of experience in both the public and private sector, Gilmore has built a reputation as a coalition builder and skilled negotiator. Sea Grant board of directors and holds an adjunct faculty position at SUNY Stony Brook, where he teaches a graduate level fisheries management course. He is also an avid marine angler, dividing his efforts between Long Island Sound’s south shore and southern New Jersey. 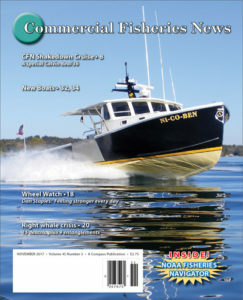 NOVEMBER 2017 issue of Commercial Fisheries News.